The Adamsburg and Community Volunteer Fire Department is proud to honor our deceased firefighters. We appreciate all the time and services they provided to the betterment of this company and all the lives that were changed, touched, and helped by these members. Through there unselfish acts they helped build the foundation for the current fire department. We realize without these individuals this department may not be here today to serve the community. Please take a moment to honor these members, and remember the sacrifices made everyday by public safety workers around the world. With a fire raging and suffocating smoke filling his home early Thursday, Jack Gazalie did what came from years of training as a volunteer firefighter and rescued his mother and daughter. He couldn’t however save himself: Firefighters found his body on the bedroom floor near the window shortly after extinguishing the fir eat his Jeannette home. An autopsy showed that Gazalie, a member of Adamsburg and Community Volunteer Fire Department, died of smoke inhalation, said deputy coroner Dennis Johns. The autopsy also showed that Gazalie had heart problems that contributed to his death, Johns said. By the time firefighters reached the blaze at 721 Clay Ave., it was too late to save Gazalie. Gazalie, 46, spent his finale moments ensuring his mother, Norma Simpson, 71, and daughter, Jackie Gazalie, 20, were able to climb out the window. As two Jeannette Police officers and a passer-by beckoned for Gazalie to get out of the building, Gazalie vanished into the smoke. Simpson and Jackie Gazalie, who lived with her father in the apartment, were treated at Monsour Medical Center, Jeannette, and released, a nursing supervisor said. The extent of there injuries were not disclosed. That two people were able to make it out alive at all is a miracle, according to George Taylor, a Greensburg resident who happened to be driving by the home at the moment it erupted in fire. It was just happenstance Taylor, who was out for a night of spotting deer and drinking dinner coffee until just after 2:00am, decided to cut through Jeannette en route home. He saw smoke pouring out of the eaves and pulled over to the curb to investigate. Taylor rushed back to his van looking for a fire call box or a telephone booth. He found none, but managed to find a young women sitting on a porch and asked her to call 911. When he returned to the fire, he could see Gazalie standing behind a window, flames ripping from the roof into the night’s sky. Moments later officers Mark Allen, and John Ryan from the Jeannette Police Department arrived on scene. Taylor was credited for quick thinking when he and the officers were unable to get anyone to jump from the onto the side walk, a drop of about 15 feet and steeply sloped. Taylor, a former firefighter, backed his van up to the building beneath the window, and one of the officers climbed onto the roof and began pulling the women out. The first fire trucks were just now screaming down the street when Taylor looked up at the window behind which Gazalie was standing. Jeannette firefighters made several attempts to rescue Gazalie, but all failed. Fire crews squelched the blaze in less than an hour, but no cause has been determined as of yesterday afternoon. Gazalie was widely known among emergency personnel. He had worked at the 911 center for the past nine years and was remembered warmly yesterday by fellow worker Stevens. Shiefko remembered Gazalie, who was captain of Jeannette’s auxiliary police force, as easy-going and well liked. 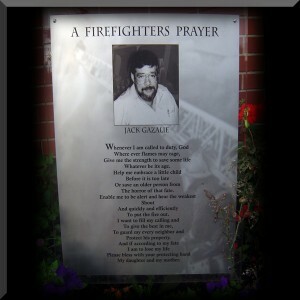 Jeannette Fire Department Chief, Mike Bertolino knew Gazalie both professionally and personally because of Gazalie’s membership with Adamsburg Fire Department. When the call came in across his scanner at 2:19 a.m. yesterday, Bertolino knew where he was going. And while Taylor spent part of the yesterday wondering if something more could have been done to save his Gazalie, others said Gazalie did exactly what they thought he would have done.